The one-piece rubber outsole of the Under Armour Jet 2017 is loved by many because it does not squeak. Several buyers mention that the shoe model is true to size like the KD 11 of Nike. 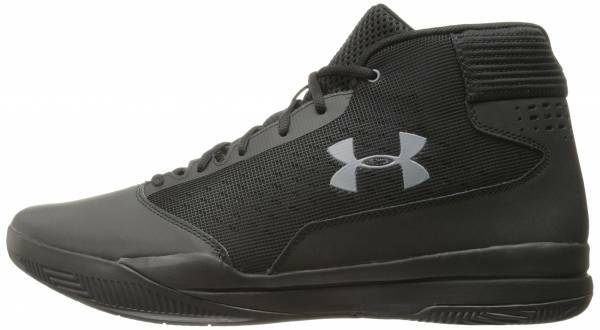 A large number of wearers mention that these Under Armour sneakers are not only good for playing hoops. They are also great for other activities like hiking, biking, walking, and weight training. The lightweight upper is recommended by most buyers because of the flexibility of the shoe model. Plenty of users left comments that these UA basketball shoes are attractive and great for street style. The herringbone traction of the shoe is loved by most because it provides an ample amount of support and balance. These Under Armour basketball shoes need some time to break in, say a few. That does not spare the UA HOVR Havoc. Some users complain that the forefoot area of the shoe is not breathable enough. A couple of purchasers claim that they can feel some pinching in their ankle area when they wear the shoe. Some wearers mention that the uppers of these Under Armour shoes start to tear after just a few months of use. The Jet 2017 is another budget basketball model from Under Armour. Aside from its above satisfactory comfort, it is also proven to deliver a good amount of responsiveness and support. Purchasing this pair will not only be perfect for sports use, but also for everyday casual wear. The Jet 2017 is another mid-top basketball sneaker from Under Armour. It has EVA for the midsole and inner padding, which promises comfort and support to the athlete. Herringbone traction on the outsole keeps the footwork steady on-court. Cushion. The performance of the Under Armour Jet 2017 is from the molded EVA foam in the midsole. It is a lightweight foam which can provide superb shock absorption and good responsiveness. It also provides stability and support for side-to-side movements. Adding to the comfort is the EVA insole of the shoe model. It delivers underfoot cushioning and minimal foot slippage to the athlete. Traction. The Under Armour Jet 2017 has a herringbone pattern on a one-piece outsole. This exceptional traction pattern has been proven to keep the athlete’s feet steady on the court. Length and Width. The Under Armour Jet 2017 comes in the standard width and length. A good number of users claim that the shoe is narrow and runs long, so new buyers are advised to go up half a size. The shoe model is designed to have a good amount of space in the toe box. Lockdown. The Jet 2017 has a traditional lace-up closure for an adjustable fit using oval shoe laces. The enhanced padding around the inner collar and the tongue of the shoe helps support the ankle for a better lockdown. The material in the upper of the Under Armour Jet 2017 is made of synthetic leather and textile. This combination, together with perforations, promises breathability throughout the shoe. Another contributor of ventilation would be the mesh material in the tongue. The toe cap of the shoe helps increase the durability of the shoe. The mid-top Under Armour Jet 2017 has a round-toe silhouette. This simple and classic-looking shoe is good for both casual and on-court use. The signature Under Armour logos are located on the outsole, insole, top of the tongue, and on both sides of the shoe.